Food without a clicker works quite well - even with greyhound puppies, as demonstrated by Geoffrey and Ellie Goldstein. When Playtraining Your Dog, and Treats, Play, Love were published, the readers’ and reviewers’ responses were overwhelmingly complimentary. This was nice because writers, like obedience dogs, can use all the positive reinforcement that they can get. But one reader had a complaint to make about the book’s training methods and it was a valid objection. She had been the victim of an automobile accident that had left her handicapped and she correctly observed that playtraining is a very physically active training method. She was right. It is. 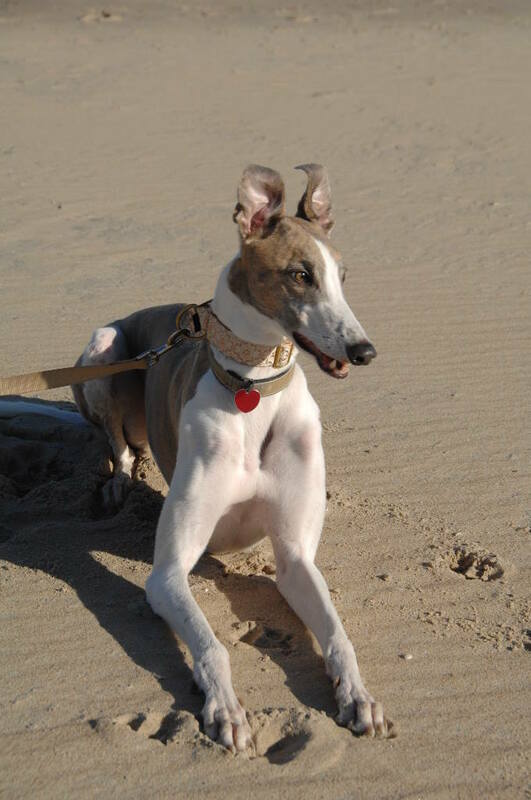 It encourages the handler to run, jump and play with the dog and it was developed because I like very active dogs (dogs don’t come much more active than greyhounds) and I enjoy playing with them. But what about the handicapped, or elderly, or just physically unfit handlers? There should be a way for them to train their dogs without a lot of physical effort. At the time that the lady wrote to me, I didn’t have an answer for her but I kept looking for one. As I got older and the dogs got younger, I wanted an easy way to teach them the basic stand, sit, down, and heel without having to push, pull and correct the dogs into the desired position. I had shown in breed for years and was used to baiting dogs into show stands, stop on stands, and gaiting patterns. Many obedience folks think that show dogs are not trained, but the good show dogs are impeccably trained. Every move they make is choreographed and under control, while at the same time they perform with a speed and happiness that should make them the envy of obedience trainers. There is no place in a show ring for an unhappy or slow moving dog. 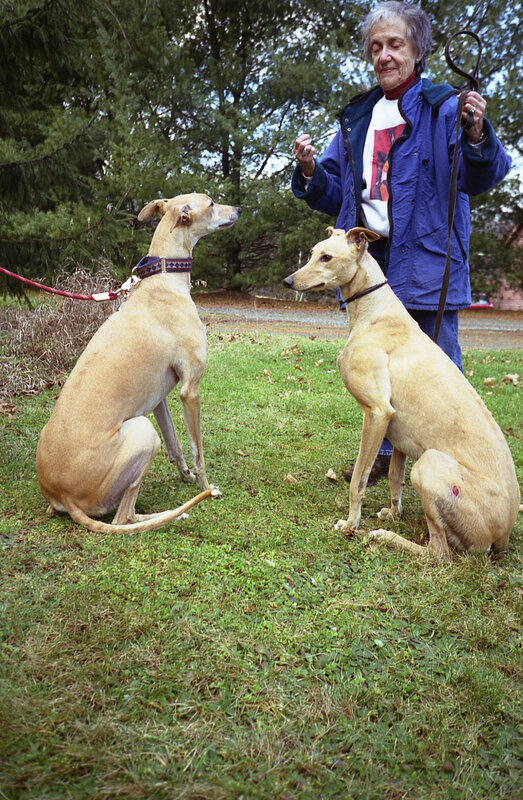 It was surprisingly easy to adapt ring baiting techniques to teaching obedience positions. The result was the food training methods shown in these photos. Then I attended one of Dr. Ian Dunbar’s excellent seminars on puppy training and learned that he was using the food baiting technique for his puppy training classes in which the dogs are too young to stand much correction. He was a little apologetic about the method, using the youth of the puppies to justify it. I was using food training for both puppies and adult dogs and my excuse was simply that it works. One of the advantages of food training is that it can be used by very inactive handlers and people like the handicapped lady who had first asked me how to train. But it also works for able bodied folks. In food training you rarely touch the dogs’ body. He is guided with the leash and food and motivated and rewarded with the food. The first step in the training is to teach the dog to bait, that is, to teach him to hand feed. Dogs are not born knowing how to do this. I wish I had a nickel for every person who has told me they can’t food train because their dog won’t eat. Their dogs wont bait either because they are afraid or because they have never been taught to bait. First the dog has to learn that anything that you hand them to eat will taste better than the food that turns up in their dinner pan each night. If you hand a carrot to a horse that has never been hand fed, the horse will spit it out and ignore it. The same applies to dogs that have not been taught to bait. In order to teach them to bait properly the food has to be something that the dog really likes. I have known desperate show owners to use flaked smoked trout for a dog that would bait for nothing else. More common baits are liver, roast beef, cheese, and chicken. There is a variety of commercial dried liver products and jerky treats available that are more enticing than plain old dog biscuits. The second requirement for food training dogs is for the dog to be relaxed. If a dog is tense or apprehensive it ruins his appetite and he is not going to eat. You cannot food train and force train a dog at the same time. This is one of the things I like about food training. The leash is used for guidance, not snap corrections. This would be a good place to train on the dead ring or a buckle collar until you can resist snap correcting the dog. In food training sessions the dog will accept a light pop on the neck as long as it is not punishing. In this training method we are not trying to correct them for being wrong. We are trying to pattern their behavior into the habits that we want to create. Cullen intently watching Ann's tidbit-holding hand while his brother Merlin is distracted by a bird. 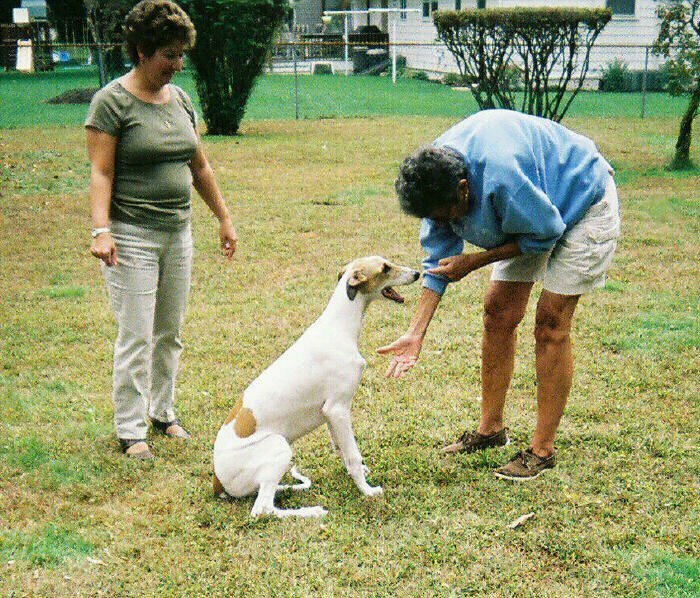 For the sit the bait hand moves up and back at the same time, moving up over the dog’s head at a 45 degree angle towards his rear. What we are trying to do is raise his head and get him to lean back. A standing dog can only raise his head so far. If he wants to reach something higher than his standing head height, then he can raise his nose further by sitting. This changes the angle of his back and lets him raise his head higher. The leash is snug in this exercise to keep the dog from backing up as your hand moves towards his rear. As soon as he sits he gets his reward. If sitting will not raise his head high enough to reach the bait then the dog’s next way of raising his head even farther is to first sit up and then stand on his hind legs. Neither is difficult to teach, although I try not to teach them to extremely large dogs because of the length of back that they have to balance. Christopher, the male dog in these photos, had never been taught to sit up; he just volunteered to do it while we were taking the pictures. His much smaller sister, Love, had been taught the sit up and stand up and apparently Chris had grown jealous of her showing off. If you want to teach the dog to sit up, use a cue other than “Sit up” which conflicts with the obedience “sit” and “hup” cues. I use “balance” as the sit up cue. For the stand your hand is moved forward from the dog’s nose on the same level with his nose. He will stand up to let his nose follow your bait hand and you can restrain him with the leash to get him to stop in the standing position where he is fed and petted. All we are trying to teach here is the stand, not the stand-stay. If he stands long enough to reach your bait hand, that is fine. For the stand-stay the dog is first taught the stand. Then after he stands I will reach down and make small changes in his foot positions, then run my hands over his body and teach him how to stack and be touched. Then I walk around him, keeping my hands on him, doing a variation of a show examination, and always touching him to steady him in the stand. After circling him I end up back in the heel position. It takes a long time to teach a good stand. Most people rush it because it seems simple but it is the most time-consuming to perfect of the novice exercises. The dog starts in a sitting position. For the down your hand drops straight down from his nose to his toes. This should pull his head down. Then the bait hand moves forward along the ground. And if his nose follows, he will walk his front feet out into a down position. Some dogs walk out part way but keep their bodies humped up to keep their belly off the ground. Just laying your left hand on their back will cause them to settle down further. As soon as the dog is down you open your hand to reward him with the treat. There are two basic rules for heeling. (1) Food speeds the dog up. (2) Leash corrections slow the dog down. Most dogs start out heeling plenty fast and end up heeling very slowly. Leash corrections can bring an untrained dog under control because you want to slow down the out of control dog. But leash corrections cannot make a dog work faster once it is trained and has gone ring sour and that is the reason we see so many slow heeling dogs. All dogs start out too fast, so we learn to slow them down, especially when judges call for a slow heel. When we overshoot into excessive slowness it is time to eliminate the leash correction and come up with a new method to gain speed. Food will increase the dog’s speed. Most of us are taught to carry the leash in both hands for maximum control of lunging dogs. I still use that method for rank beginning dogs but why use it for either sensitive or trained dogs? Do you still need to give a two handed correction? Since the only function of the leash is to pull back on the dog to slow him down, or to tap him lightly on the neck if he misses a turn, couldn’t that be done with the leash held only in the left hand? It can, and I changed to one handed lead handling. Your left hand with the leash is behind the dog’s line of vision so he cannot anticipate corrections. Your right hand is free to bait the dog which encourages him to stay up with you and to keep an eye on you. I bait dogs in heeling at any point where I want them to hurry in the fast heel: as they come out of a turn; as they complete the half of the figure eight where the dog is on the outside of the circle; when they first rise out of the sit to start heeling; anytime that I want them to speed up to keep up with me; and when I start to run. They learn to connect these parts of the exercise with food and they develop the habit of accelerating to move quickly through these maneuvers. The recall is not illustrated but is taught by calling the dog whenever he is walking on leash and by stuffing food in his mouth when he reaches you. Once you have taught him the sit, separately, then you can also ask him to sit in front of you before he is rewarded. Dogs catch on to the “Come for food” idea quickly. I have taught entire litters of young puppies to race up to me and sit for treats when they hear “Come.” All I have taught them is that when they hear the word “Come” I am handing out food. It works like a charm. For adult dogs who have never learned to equate Come with food, it has to be taught on leash. Once he knows how to sit in front of you for food, he can learn the finish. I use a cue other than “heel” for the finish, since, to the dog, finishing and heeling are different. And don’t us the word “Finish” because that is what the judge will say. I use “Go around” for a clockwise circle and “Swing” for a counterclockwise finish. For the finish the dog is led through the maneuver with his nose. F or the Swing finish you lead him in a counterclockwise circle past your left side and get him to turn around and sit beside you. For the finish around your body you lead him in a clockwise circle past your right side, behind you and back up to your left side where he sits. The bait hand is on a level with his nose while you are guiding him around the circle. Once he is in heel position you raise your bait hand to bring his head up and cue him to sit. While you have not been trying to teach the dog hand signals, the fact that he is following your bait hand through all these exercises will have taught him his first lessons in hand signals. The rising hand means “sit.” The hand going down to the ground means “down”. The hand moving away from his nose at nose level mans “stand.” The circle to your left side means “Swing finish.” The hand moving away from his nose at nose level mans “stand.” The circle to your left side means “Swing finish;” while the circle to your right side means “Finish clockwise.” When the time comes to teach him formal hand signals, you can build on what he already knows. This article was originally written and published in Off-Lead, 1982 and in CG F 98.